With only 15 minutes of hands-on time, this refreshing Brussels sprouts salad will make the perfect Thanksgiving side dish. Sitting down for Thanksgiving dinner is one of my favorite things to do. Surrounded by amazing food and people you love. What could be better? Unfortunately, Thanksgiving may be a time of great stress for some families. Perhaps someone just lost their job, perhaps there was a death in the family, or perhaps there were some unexpected expenses. If you’re feeling extra blessed this year, consider giving back. We typically do so through our church, but there are other great organizations like Feeding America that can help you share a little love this Thanksgiving. Feeding America is the nation’s largest hunger relief charity. They have a mission to feed America’s hungry through a network of food banks, and to get people involved in the fight to end hunger. You can easily donate on their website but there are a lot of other ways to give as well. Take a minute to consider it! If you’re still looking for ideas to fill in some gaps on your Thanksgiving table make sure you also check out my round-up of over 85 Thanksgiving recipes! And this salad, definitely this salad. I probably could have ate the entire bowl in one sitting. 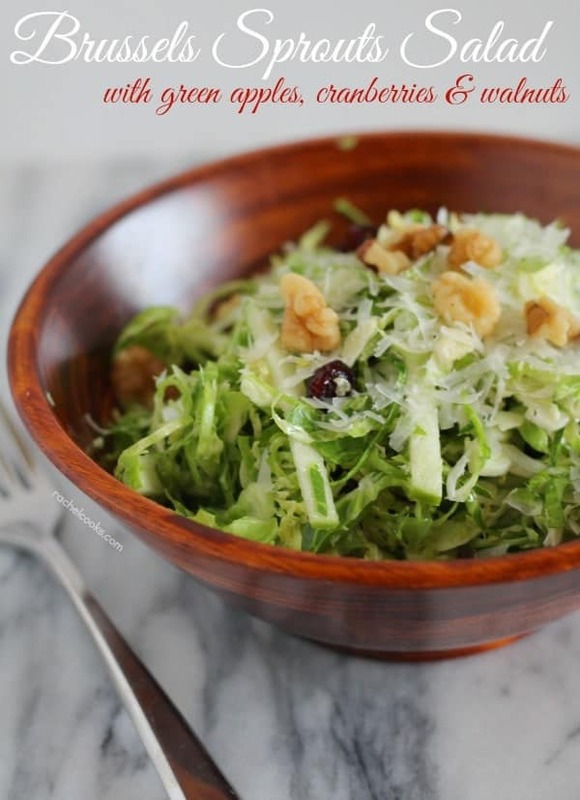 It has a little bit of everything you want in a salad — crunchy, chewy, sweet, tart, bitter, rich. Everything. If you’re skeptical of the raw Brussels, don’t be! 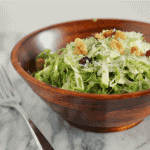 This salad is like coleslaw’s sophisticated big sis. 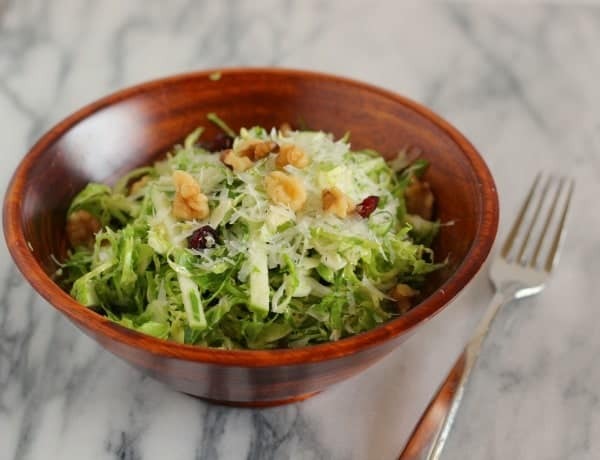 Shaved Brussels sprouts, chewy dried cranberries, nutty toasted walnuts, and rich Pecorino cheese make this salad completely irresistible. Make your life easier by shredding the Brussels sprouts in your food processor using the slicer attachment. A few times when I’ve made this, I’ve broken the Pecorino into small chunks instead of shredding it. I love the salty bite you get when you get a little chunk of cheese. If you want, you can use dried cherries instead of dried cranberries. In a small bowl, whisk together vinegar, maple syrup and olive oil. Set aside. Slice Brussels sprouts very thinly, more or less shredding them. I used the slicer blade on my food processor to quickly and safely perform this task. Pour the shredded Brussels sprouts into a large mixing bowl. 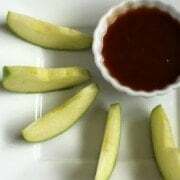 Cut the apple into matchstick sized pieces and toss in a bit of the dressing (1-2 teaspoons). Add these to the large mixing bowl with the Brussels sprouts. Also add the green onion and dried cranberries. Pour dressing over this mixture and stir well so that everything is coated. Refrigerate for at least 45 minutes to let flavors meld. Just prior to serving, top with cheese and walnuts. Verdict: I love this salad – it has become one of my favorite holiday salads. Husband’s take: My whole family loves this salad. Changes I would make: None! 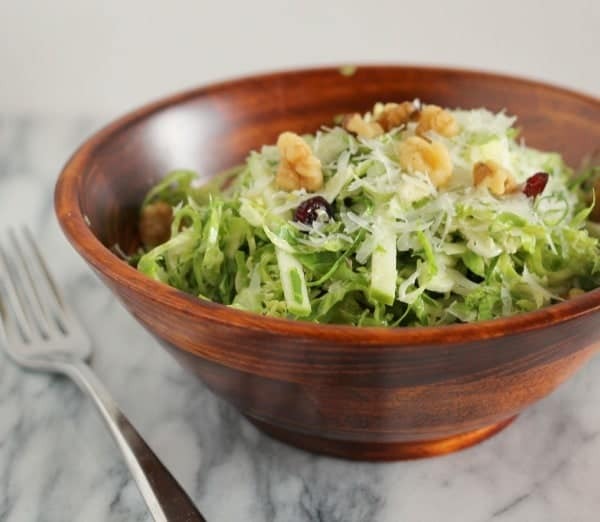 I have made this salad without without nuts for the kids – it’s great that way too! I love a good salad like this! Yum! Another great way I can enjoy brussels sprouts! 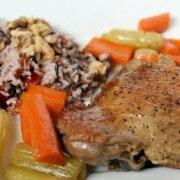 Love this recipe Rachel! Love that this is a raw Brussels salad!!! So fresh and good! I have almost everything I need to make this for lunch today, it looks amazing!! Thanks for joining in the pot luck today! This is my kind of side dish. I love the ingredient combination! This is a gorgeous side dish. I am kind of a lone-wolf on the brussels sprout love during the holidays, which I find terribly distressing – they are great and this is beautiful! Summer is salad time for me and I want this tomorrow. The cause is a good one because everyone should have enough to eat. What a killer combo of flavors in this fall salad, Rachel! I absolutely love it and would definitely want to serve it for Thanksgiving… if I were cooking this year! It’s been way too long since I’ve made a shaved Brussels sprouts salad! My next one must have apples, craisins and walnuts..yum! Oh yesssss! Gurl, I love me some brussel sprouts! Oo that looks delicious! I never think to add cranberries to my salads, but that definitely makes it more wintery and inviting. Oooh, Brussels sprouts and maple syrup? Match made in heaven, this is my kind of salad! 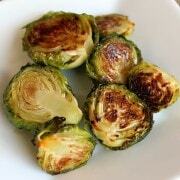 I loooove brussels sprouts..they’re my favorite veggie by far! Maple syrup on these..oh myyyy. Never had brussel sprouts like this!! Looks delicious! Cannot wait to try! Wow, your salad looks so good, I’ve got to give it a try. I just purchased a stalk of brussels sprouts at Trader Joe’s, now I know what I’ll do with it. Oh I love the flavors going on here! Would be a super Thanksgiving dish for sure.